Isn’t that a splendid header that would be well-suited as a banner for a blog? It’s that time of year and I went shopping at Canada Post and picked up Official First Day Covers from several collections in one sweep and easily met the minimum spend to have free shipping. A few items just made my eyes bug out with their splendour but I cannot – absolutely cannot – buy them. I can’t even ask for them as an impractical gift. It started pretty innocuously. 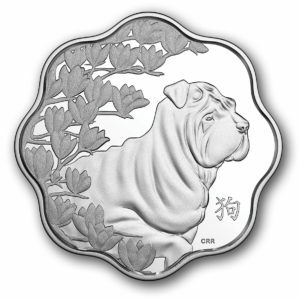 I’m being a little forward thinking grabbing up Year of the Dog paraphernalia but limit myself to stamps which are cheap and not coins. For example, this $15 silver coin sells for $101.88. Yeesh. That’s a cute breed they chose but somewhat less meaningful if you haven’t collected all 12 in the series. 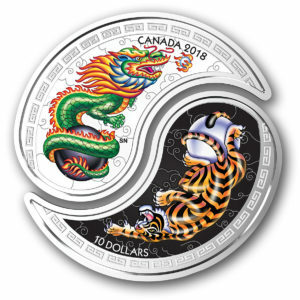 Then I saw this knock-my-socks off design for the Yin and Yang: Tiger and Dragon. 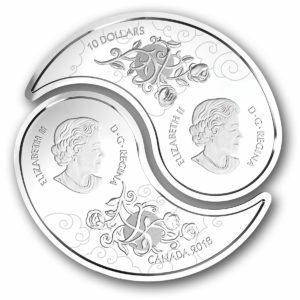 Is each half a $10 coin or only if it’s together? Like that matters! “Heroes” of Chinese tradition, the tiger and dragon are featured and fit together as a whole. The colour is stunning and incorporates the traditional black and white backgrounds of the yin and yang symbol. 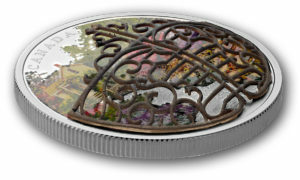 The reverse side contains motifs drawn from Chinese ceramic art. Only $164.95! I was further salivating over the next coin I saw, the $8 Chinese Blessings. 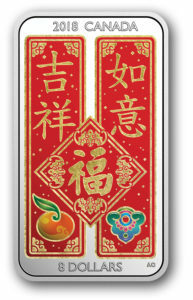 This coin in shape and design resembles banners hung on doorways around Chinese New Year and expresses one’s hopes for a good year ahead. I must be getting quite old to enjoy these colours so much. 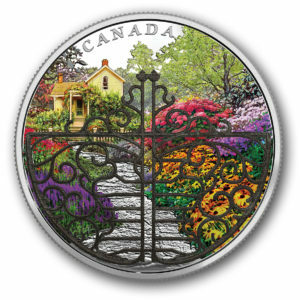 Finally, not CSG-related but just an example of the new designs the Canadian Mint is putting forth, their $30 Gate to Enchanted Garden also turned my head. The colours! The old-fashioned gate captured in 3D. I don’t have a 3D coin so this would be a good starter but jeez, it’s $239.95 for a 50 mm-diameter keepsake!